2018 recruit Hugo Blixt skated for Team East in last night’s USHL/NHL Top Prospects Game in Kearney, Nebraska. The 6’4” defenseman from Vasteras, Sweden, has 15 points (4G, 11A) playing for the Tri-City Storm. TSN’s updated rankings for the 2018 NHL Entry Draft have Brady Tkachuk at #3 and 2018 recruit Joel Farabee at #15. SportsNet.ca’s newest rankings have Tkachuk at #4 and Farabee at #12. 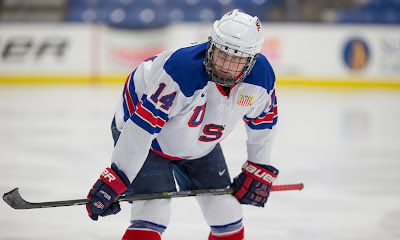 2018 recruits Farabee, Tyler Weiss and Jake Wise each assisted on a goal in the NTDP U18s’ 5-4 loss to Utica College. The fourth 2018 recruit playing for the U18s, Jack DeBoer, is profiled by USA Hockey. The 6’2” center, whose father is San Jose Sharks coach Peter DeBoer, has 15 points (4G, 11A) in 28 games this season. ● Jack Eichel scored his 16th and 17th goals and added an assist in Buffalo's 7-4 loss to Winnipeg. Head Coach Brian Durocher, who has been at the helm of the Terriers since the women’s program’s launch as a varsity sport in 2005-06, has signed a long-term contract extension. 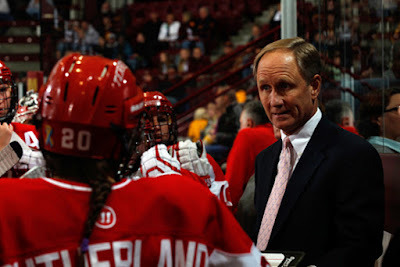 Now in his 13th season, Durocher has won more than 250 games and has averaged over 20 wins per season at BU. Former BU standout Shannon Doyle, now playing in the NWHL with the Connecticut Whale, joined The Hockey Writers for a Q&A session.